Although it is a “So Cal” spring company, we are proud to say that Acxess Spring also works for many other manufacturing companies around the United States as well as Canada, Mexico, and countries overseas in the different continents of Europe, Asia, and Australia. Now, with our online stock spring store, The Spring Store, we’re also able to provide worldwide customers with stock compression springs which may be used for prototypes, testing or as replacement springs. Not only are we able to manufacture your compression springs but we’re also able to help you with your compression spring design and all of the compression spring design calculations involved. Need a spring for a lid or ramp? We can definitely help! Plus, we’ve filled our website and The Spring Store website with useful technical articles and our advanced springs calculator software, Spring Creator, which will assist anyone in need of compression spring design information. 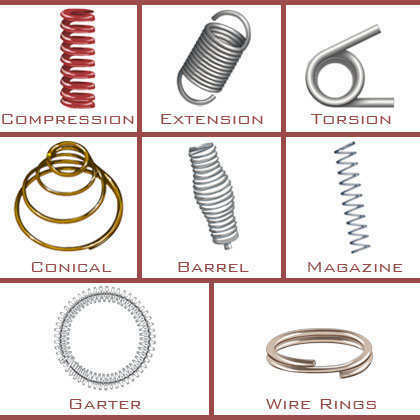 Our experienced engineers in the compression spring design field will gladly take the time to consult your spring needs and help you develop a satisfying compression spring design. Our custom and stock compression springs are manufactured in CNC coiler machines. The wire diameter capacity of Acxess Spring ranges from 0.005” wire to 1.000” wires in several material types. The material types Acxess Spring is able to provide are Music Wire ASTM A228, Hard Drawn ASTM A227, Stainless Steel 302 A313, Stainless Steel 316 A316, Stainless Steel 17-7 A313, Chrome Silicon A401, amongst many others. Consult our “Properties of Common Spring Materials” page to learn more about the listed materials as well as other more extravagant material types and contact us to request a specialty spring wire. Because we are an international spring company, we offer world wide shipping. Quality control is applied on all compression springs (custom or stock) before they ship out so you can clearly expect, not only the best manufacturer-customer service but, great quality springs at affordable prices. We will walk you through your spring design process as well as the manufacturing process to make sure that you receive the ideal compression spring which will work as expected in your device or mechanism. Don't take it from us, though. You also have access to our “Customer Testimonials” page where you're able to see what customers have to say about Acxess Spring - Compression Spring Manufacturer and Distributor. If you happen to have any more doubts about how Acxess Spring works, check out our “Terms and Conditions” page to learn more.